A lot of us are doing low carb diets, because, well, they work. It is difficult giving up all those favorite foods. 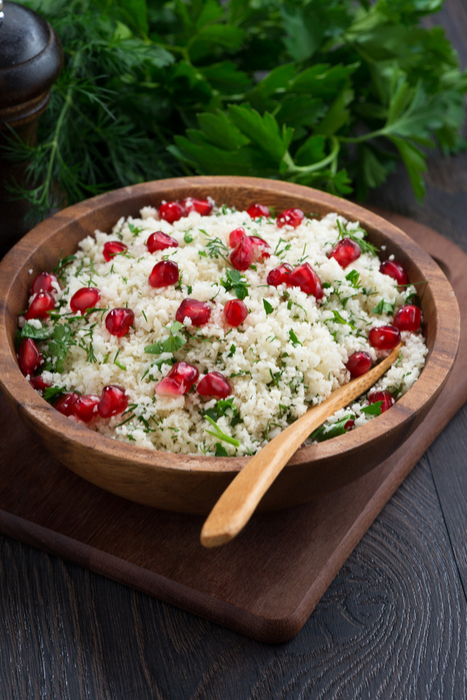 Which is why it’s fun to find a substitute for a beloved Middle Eastern bulgur wheat salad, tabbouleh, made with raw cauliflower “rice.” We had it at our Purim meal: a perfect “nafochu,” something that is turned around, just like the Purim story. Place stalks in food processor and mince to a fine texture.